3/4 pound sharp cheddar cheese, grated. Brown ground beef in a large skillet until cooked through. Melt all ingredients together over low heat until cheese is melted. Cool. Open crescent roll package and pat out, use flour if sticking. Cut rolls into small square. Add a spoonful of beef mixture and wrap dough completely around. Set on cookie sheet covered with parchment paper or silpat. Bake in oven at 350 degrees until Beef Bombs are puffed and golden brown. 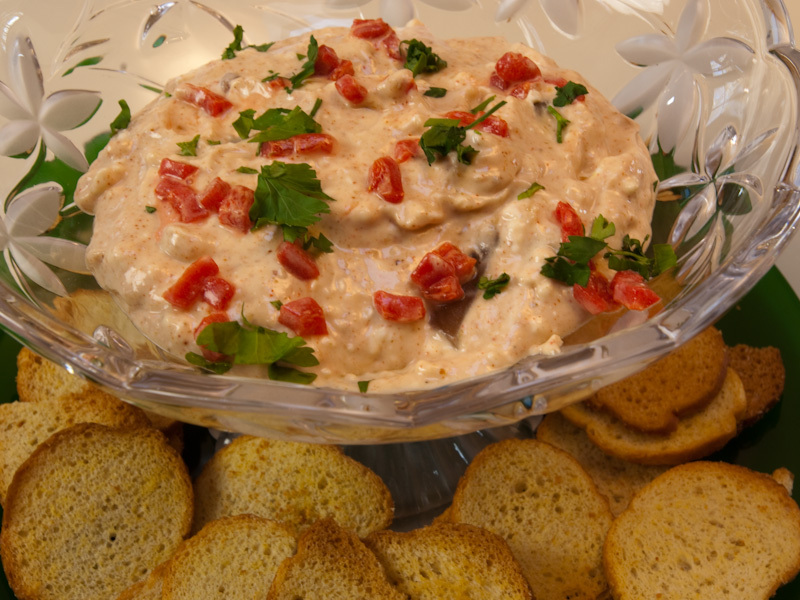 In a bowl, combine cream cheese and sour cream. Add curry, cayenne and chutney. Beat cream cheese, onion, mustard and pepper sauce, cheese and paprika. Blend well. At this point, if you want to make 2 smaller trees, divide mixture in half and refrigerate until firm enough to shape. Or, you can leave the mixture altogether and make one large tree. 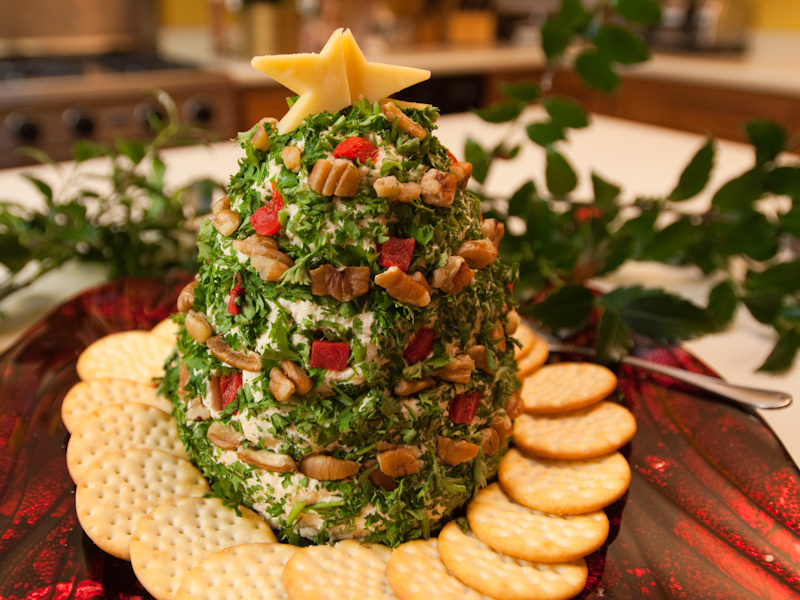 Remove from refirgerator, place on a plate, and shape into a cone (“tree”), Refrigerate until firm. Press the parsely onto the tree(s). Press walnut pieces into the sides forming a garland. Take small pieces of pimento and dot here and there. Using a small star cookie cutter (or you can cut it free form), cut a star out of the slice of cheddar and top your tree(s). 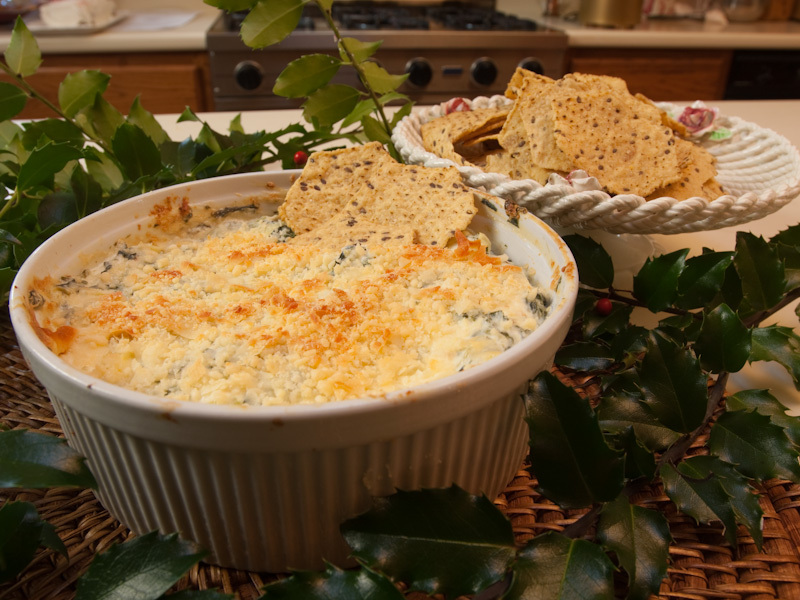 Refrigerate until serving time and serve with your favorite crackers. Boil spinach until thawed. Drain and squeeze all as much water as possible. Heat cream cheese in microwave for about 30 seconds until softened. Combine all ingredients in a bowl except parmesan. Blend well. Top with parmesan. Heat in 350 degree oven until hot and bubbly, about 8 minutes. NOTE: for this recipe, we do not recommend using pure vanilla. It will turn the white meringue and off color. If you want vanilla flavor, use the clearn, imitation. Beat the eggs whites and cream of tartar in a mixer for about 3 minutes. Set the mixer to high and beat another 3 minutes until the egg whites are fluffy. Add the confectiones sugar, 1 tbsp at a time and continue beating until the whites are stiff and glossy, about 5 minutes. Beat in the extract of choice. Line baking sheets with parchment paper. Spoon the meringue into a pastry bag fitted with a decorative tip. Free form your shapes – circles for wreaths, candy canes, heart, stars, etc. 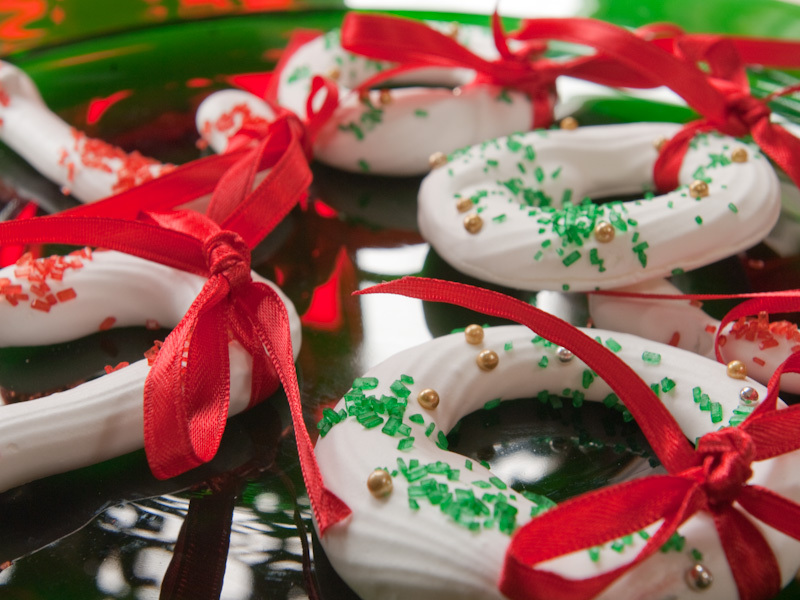 Decorate the meringues with colored sugars or dragees. Bake for about 1 hour, rotating the sheets halfway thru baking. The meringues should be set but not browned. Remove and cool completely. STORAGE – the meringues will keep for about 2 weeks if put into sealed plastic containers, separating layers with wax paper. Do not refrigerate or freeze. In a bowl, combine the flour, cocoa, powder, soda and salt. Mix well with a whisk to blend. In bowl of mixer, beat egg whites until soft peaks forms. Continue mixing and gradually add the 1/2 cup sugar and beat until stiff peaks form. Set aside. In a clean mixer bowl, beat the egg yolks and vanilla for about 3 minutes. Gradually add the 1/3 cup sugar and beat another 3 minutes. Gradually add the flour mixture, alternating with the water. Gently fold the egg whites into the chocolate mixture using a large spatula. Spread the mixture evenly into the prepared pan and bake at 375 degrees for about 12-15 minutes or until it springs back when lightly touched. While the cake is in the oven, take a clean tea towel, lay it on the counter and dust with confectioners sugar. When the cake is done, invert it onto the tea towel and immediately roll it up starting at the long side (for a shorter, fatter cake, roll from the short side). Place on a cooling rack and cool completely. Beat whipping cream until slightly thickened. Add the “dust” and powdered sugar and beat until stiff peaks. 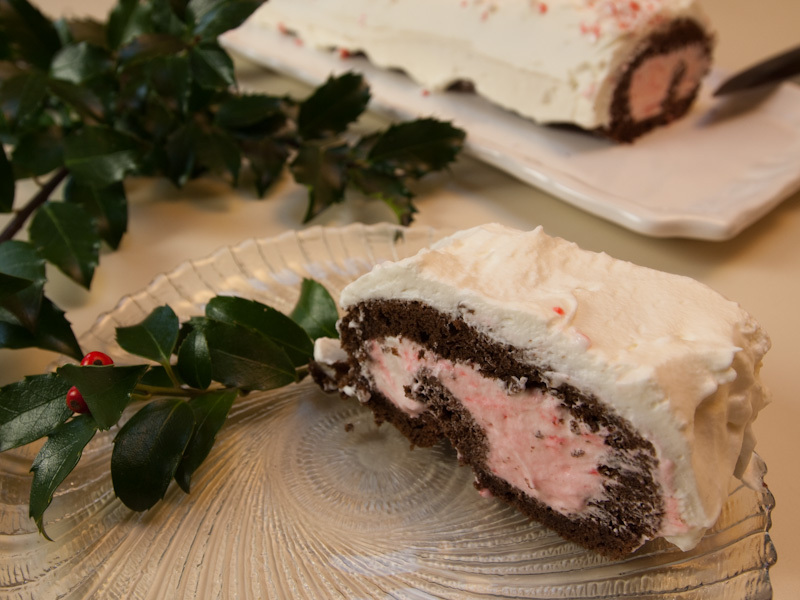 Unroll cake roll, spread with peppermint filling and reroll. Refrigerate while making topping. Beat cream until soft peaks. Gradually add powdered sugar and beat till stiff peaks. Frost the outside of the roll and decorate with candies. 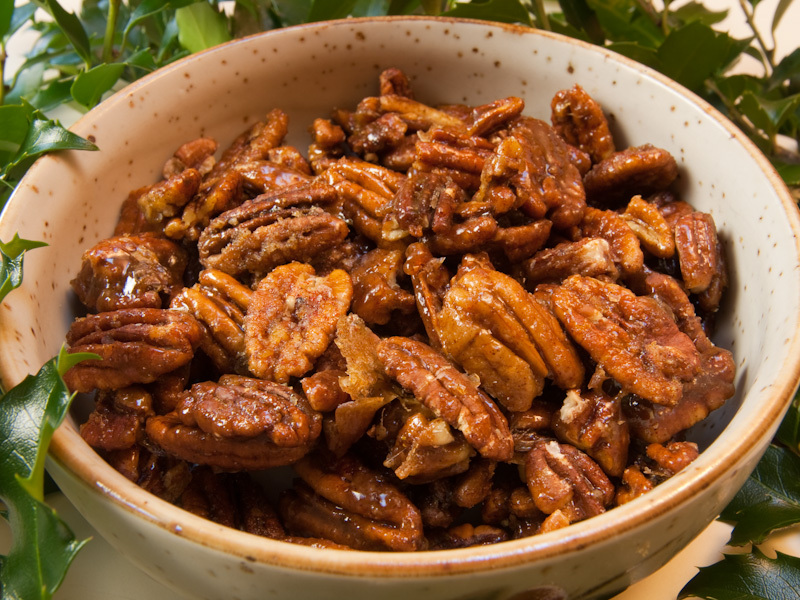 Mix nuts with honey and add spices. Mix well. Bake for 20 minutes at 375 degrees on a baking sheet with foil and sprayed with cooking spray. NOTE 1: To brown them – in a pan large enough to hold them in one layer, melt 2 tbsps butter. Add the onions and swirl them until they brown. Add enough chicken sauce to come halfway up the side of the onions. Cover and simmer slowly for 25-30 minutes or until they are tender. NOTE 2: Sauteed mushrooms – trim and quarter the mushrooms. Saute the mushrooms in 1 tbsp butter and 1 tsp olive oil. Swirl until they absorb most of the butter. Add 1/2 tbsps finely chopped shallot. Season with salt and pepper. Saute the blanched lardons in a large pan until they release their fat. Remove, leaving fat in pan. Brown the chicken in the pan, adding more olive oil if necessary. Flame with the brandy. Remove the chicken from the pan. Add the sliced onions to the pan and saute until tender. Drain the onions and most of the fat from the pan. Season the chicken with salt and pepper. Put the chicken back in the pan. Add the sliced onions, garlic, bay, thyme and tomato. Pour in the wine and enough stock to cover the chicken. Simmer about 20 minutes until the chicken is tender – or put the chicken in 325 degree oven. Remove the chicken. Taste for seasoning. Whisk the beurre manie into the pan until the sauce thickens. Add the onions and mushrooms to the pan, coat with sauce. Peel the onions. An easy way to do this is to immerse them in boiling water for 2-3 minutes, then remove them and put them in cold water for another 2-3 minutes. Cut off the root end and squeeze and the onion should pop out. Remove the stems. Cut tomatoes in half crosswise. Press out the juice and seeds. Sprinkle lightly with pepper and salt. Blend remaining ingredients in a mixing bowl. Season and then fill each tomato half with the mixture (about a spoonful or two). 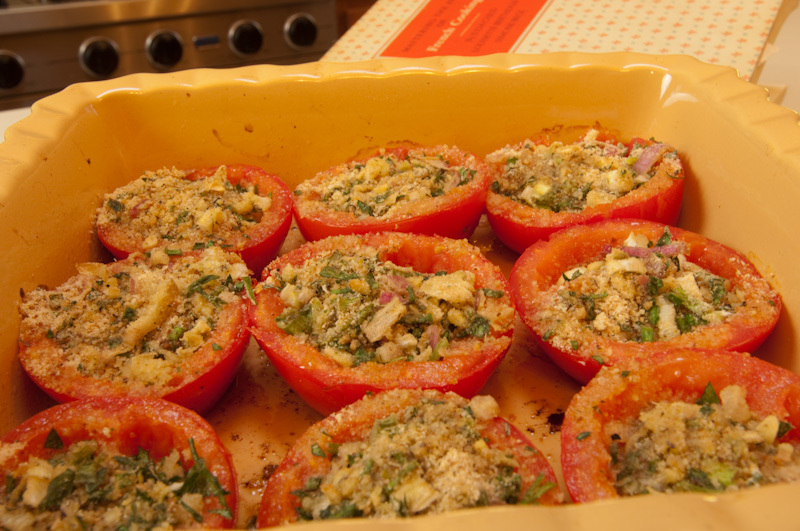 Sprinkle with a some olive oil and arrange the tomato halves in a roasting pan. Keep them well separated. Shortly before you are ready to serve, place the roasting pan in the upper third of a preheated oven and bake until the tomatoes are tender but still hold their shape and the bread crumb filling has browned slightly (about 10 to 15 minutes). This recipe is good for 4 to 6 people. 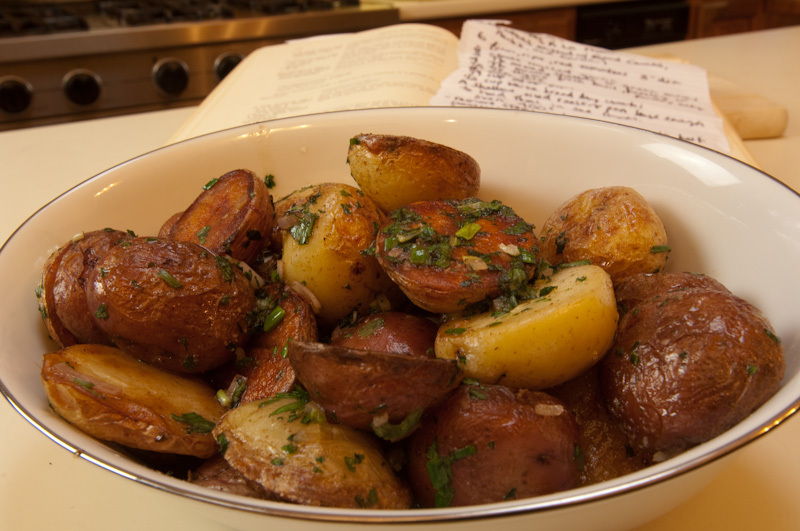 Cut the potatoes into 2 inches long and 1 inch wide if using large potatoes. Small new potatoes can be cut in half. It is important that the potatoes are very dry. Add enough clarified butter or the butter and oil to the skillet to film it by 1/16 of an inch and set over moderately high heat. When butter is hot but not coloring, add potatoes to skillet. Leave for 2 minutes, making sure the heat is hot but not coloring the potatoes. Shake skillet back and forth to roll the potatoes and to sear them on another side for 2 more minutes. Continue for 4-5 more minutes until the potatoes are a pale golden color all over. Then sprinkle the potatoes with salt and roll them again in the skillet. Lower heat, cover the skillet, and cook the potatoes for about 15 minutes, shaking every 3 to 4 minutes to prevent them sticking to the skillet, and to ensure even coloring. They are done when easily pierced with a knife tip or they yield slightly when you press with your finger. Turn off, add the butter and herbs, sprinkle on the pepper, and roll the potatoes in the skillet so they glisten with herbs and butter. Arrange the potatoes around your plate in a pretty manner. Add oil to fry pan and cook chicken until lightly browned. Remove from pan. Add butter, onion and cinnamon. Combine well. Add all of the rest of the ingredients except the spinach or cilantro. Bring to a boil, turn down and simmer about 5 minutes. Add the chicken back to the pan and simmer 5 minutes more. Tasty Tandori Chicken and Rice Palau – Pam and Lee welcome Sunita and Nahendra into the TIK ktichen for a lesson in preparing some Indian food. Clean, wash and dry the chicken breast. Cut into large chunks (approximately 4-5 pieces per chicken breast) and put them in a container. Sprinkle with salt and lemon juice, and cut slashes in the chicken pieces with a sharp knife to allow salt and lemon to penetrate. Then toss to coat, cover and set aside for 30 minutes at room temperature. Grind the coriander seeds to powder in a coffee grinder. Add all the marinade ingredients into a blender and puree all the ingredients. Mix the ground coriander seeds to the pureed marinade ingredients. Pour the mixture over the Chicken and rub it into the chicken turning the chicken several times. Cover and let it sit for 12 hours in the refrigerator. 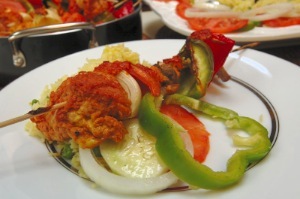 Skewer the chicken with the vegetables of your choice, such as onions, tomatoes, mushroom, red and green bell peppers. Place on a rack in a pan and brush the vegetables with the marinade ingredients. Place the rack in the pre-heated oven at 360 degree for 40 minutes. Put the frozen peas in a glass or china bowl. Cover it with a plate and heat it for 3 minutes in a microwave oven. Leave the bowl in the microwave oven until the rice is cooked. Wash the rice in a pot and carefully drain the milky looking water. Repeat the wash process until the water is clear. Drain the water and set the washed rice aside. In a big non-stick pot (4 qrts or bigger), put the oil and heat it on medium heat. Add salt, cinnamon sticks, cloves and peppercorn in the hot oil. Lightly stir the spices and then carefully put the damp rice into this pot. Stir the mixture for 2 minutes. Then add 4 cups of water and sprinkle saffron on top of water in the pot. Gently stir the rice for 30 seconds. Cover the pot with a lid and let the water boil away. Once most of the water is boiled away (about 10 minutes), reduce the heat to its lowest setting. Remove the lid and add micro waved peas on top the rice and cover it with the lid. Shut the heat and the rice is ready to be served. Slice onions in rings, tomatoes and green peppers and place it in a tray. Sprinkle some salt and lemon juice on these sliced vegetables and mix together. 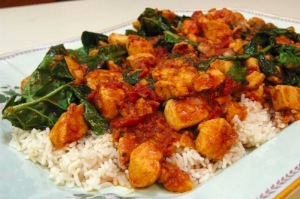 Serve the chicken with rice Palau and salad. If you always have these simple ingredients on hand, you can always make a delicious and quick soup whether it be chicken soup or use the stock for your favorite soup. The stock maybe be frozen and be waiting for you. Also, I buy the super market rotisserie chickens in a pinch for dinner when I have not had time to cook. When done with the chicken, wrap up the carcass tightly and freeze. I always have a couple in my freezer. Coat the bottom of a large stockpot with olive oil and place over medium heat. Add the vegetables and sautÃ© for 3 minutes. Add the chicken bones, water, ad herbs; simmer for 1 hour, uncovered. 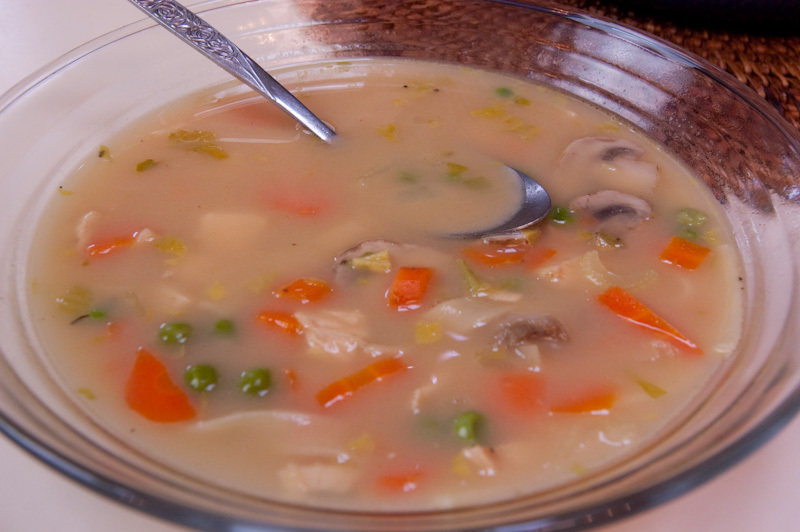 Strain the stock to remove the solids and cool to room temperature before storing in the refrigerator. Or chill it down over ice. For the stock: add all ingredients to a soup pot. Cook until chicken is tender, about 35 to 45 minutes. Remove chicken from pot and set aside to cool. Remove and discard bay leaves and onion. You should have approximately 3 quarts of stock. When chicken is cool enough to touch, pick bones clean, discarding bones, skin, and cartilage. Set chicken aside. For the soup: bring stock back to a boil, add carrots, and cook for 3 minutes. Add celery and continue to cook for 5 to 10 minutes. Add egg noodles and cook according to directions on package. When noodles are done, add chicken, mushrooms, parsley, sherry and rosemary. Add Parmesan and cream, if using. Cook for another 2 minutes. Adjust seasoning, if needed, by adding seasoning salt and pepper. Enjoy along with a nice hot crusty loaf of French bread. 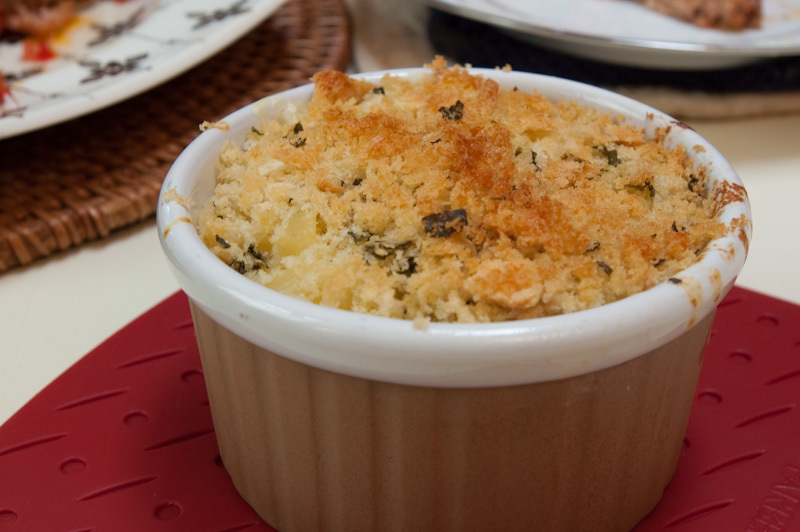 Macaroni & cheese with basil bread crumbs…mmmm. Cook macaroni for 1 minute less than directed on package and drain. Gradually whisk in milk and broth. Increase heat and bring to a simmer. and seasonings of your choice. Fold in macaroni and put into pans. In a food processor, place bread, basil, oil and salt and pepper. 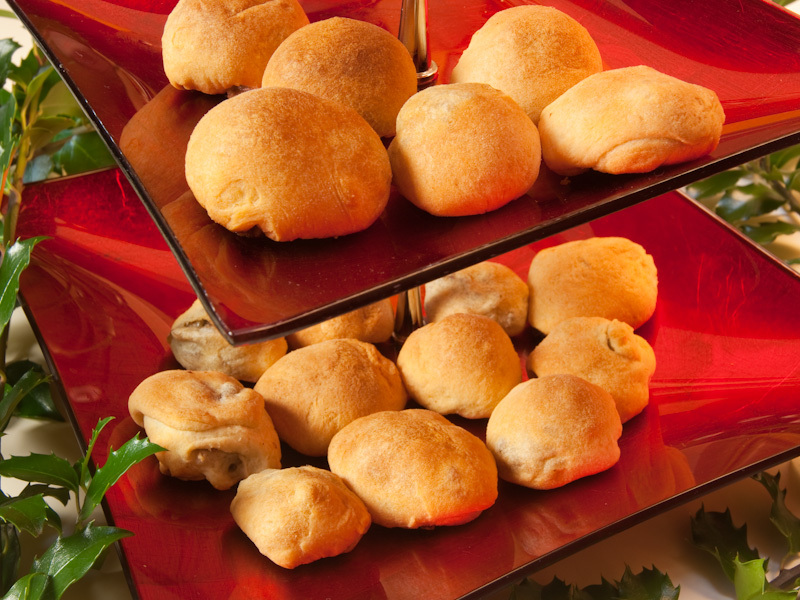 Bake until bubbly and crumbs are brown, about 15 minutes. Place bacon in large pot and cook till crisp. 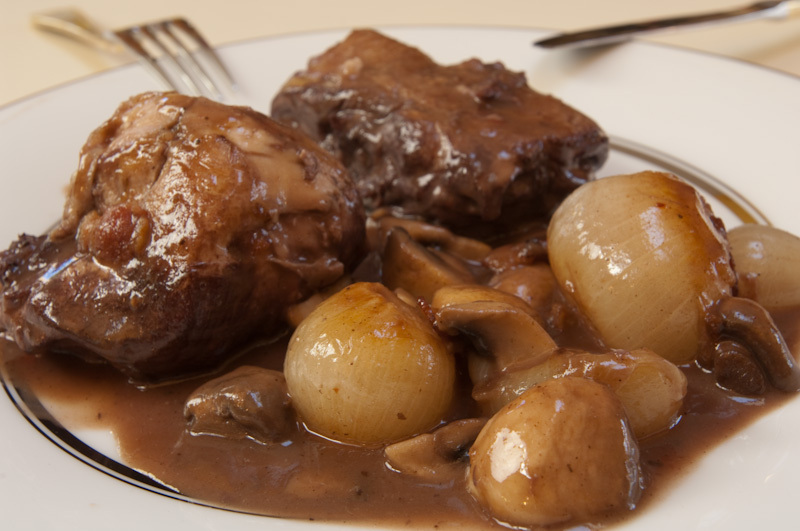 Add butter, onions, leek and celery and cook till vegetables are soft – about 5 minutes. Add tobasco, Worcestershire and thyme and cook another 5 minutes. Whisk in the flour and cook another5 minutes on medium, being careful not to burn it. 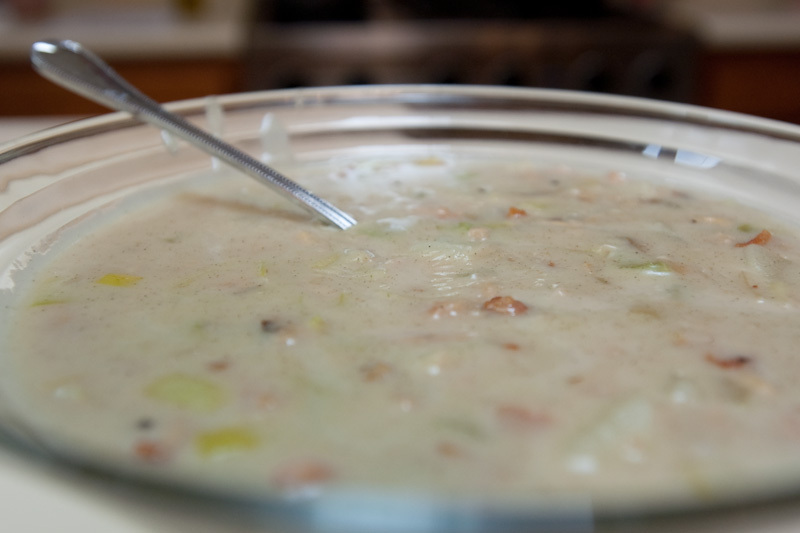 Slowly add clam juice – it will become thick. Add potatoes and cook until tender, then add clams with their juice and the cream. Taste for seasoning and add salt and pepper as needed. 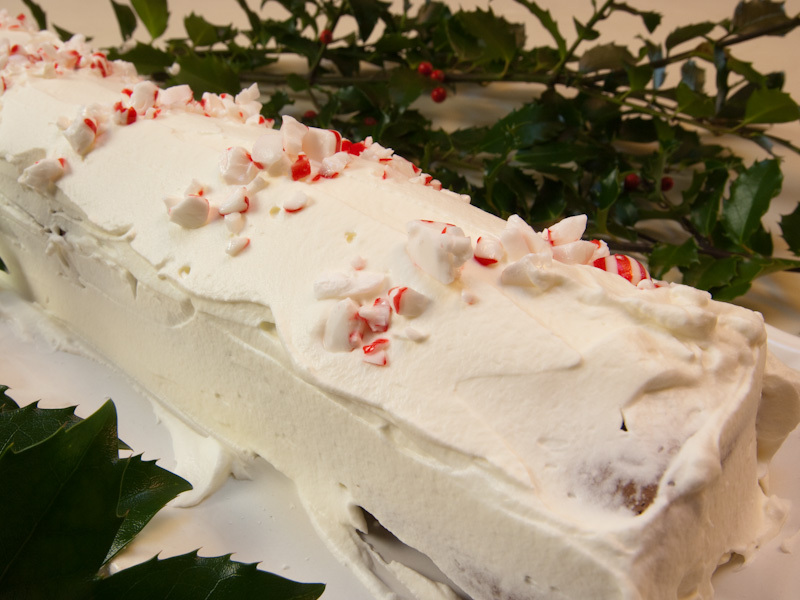 If it is too thick, add more cream until desired consistency. 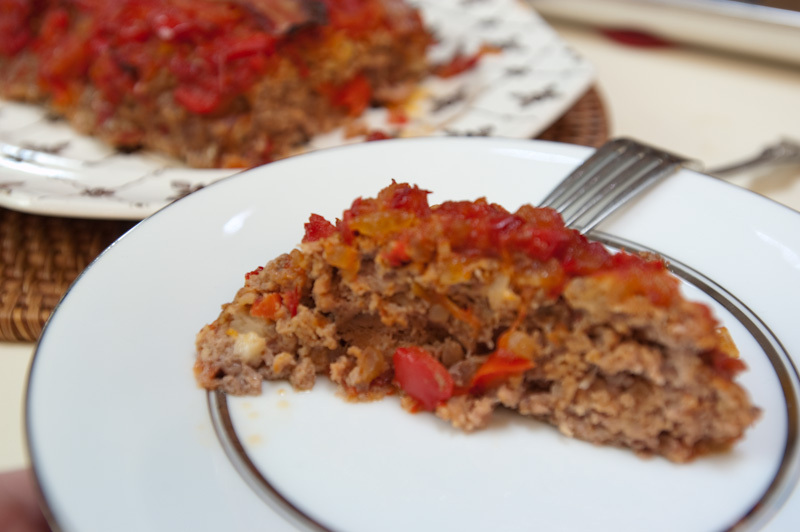 A meatloaf that is…well…just wicked good! Coat a skillet with a 2-count of oil and place over medium heat. Saute the onion, garlic, and bay leaves for a few minutes to create a base flavor. Throw in the red peppers and cook them for a couple of minutes to soften. Now add the tomatoes; adding them at this point lets them hold their shape and prevents them from disintegrating. Stir in the parsley, ketchup, and Worcestershire; season with salt and pepper. Simmer the relish for 5 minutes to pull all the flavors together. Remove it from the heat; you should have about 4 cups of relish. Place the torn white bread in a bowl and add the milk to just barely cover, swish the bread around in the milk and let it sit while you get the rest of the ingredients for the meat loaf together. This is where you get your hands dirty! In a large mixing bowl, combine the ground beef and pork with 1 1/2 cups of the tomato relish, the eggs, and thyme; season with salt and pepper. Squeeze the excess milk from the bread and add the soaked bread to the meat mixture. To test, fry a small “hamburger” patty of the meatloaf until cooked; the patty should hold together but still have a soft consistency. Taste the patty for seasoning. Lightly oil a cookie sheet. Transfer the meat mixture to the center of the cookie sheet and form into a log about 9 inches long and about 4 inches wide. Coat the top of the meatloaf with another 1/2 cup of the tomato relish. Lay the bacon across the top lengthwise. Bake the meatloaf for 1 to 1 1/2 hours until the bacon is crisp and the meatloaf is firm. Rotate the meat loaf while it’s baking every now and then to insure that the bacon browns evenly. Remove the meatloaf from the oven and let it cool a bit before slicing. Serve with the remaining tomato relish on the side. Unbelievably moist! 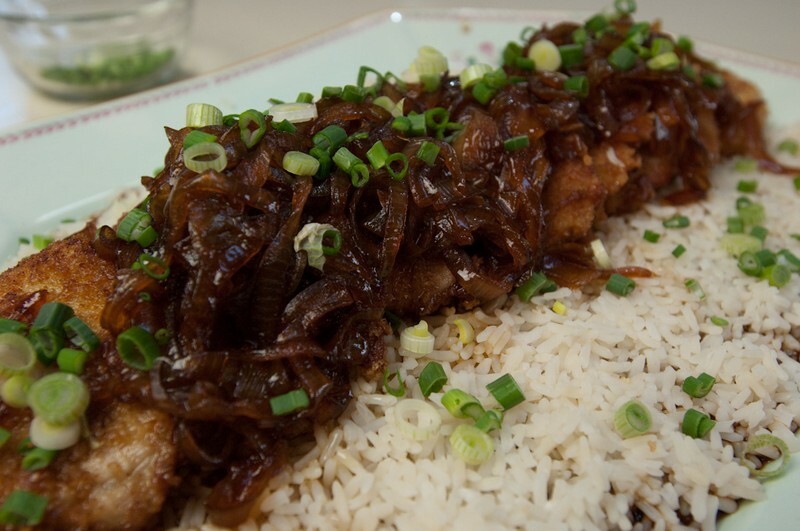 Cripy pork with a sauce that is different and exciting. Meanwhile, heat oil in a skillet. Fry cutlets in batches for about 6-8 minutes. Drain on paper towels and keep warm. In a skillet, simmer onions, broth, mirin, soy sauce, sugar and ginger over medium low heat for about 15 minutes or until onions are soft. Place sliced cutlets on a bed of plain white rice. Top with sauce and sprinkle with sliced green onions.